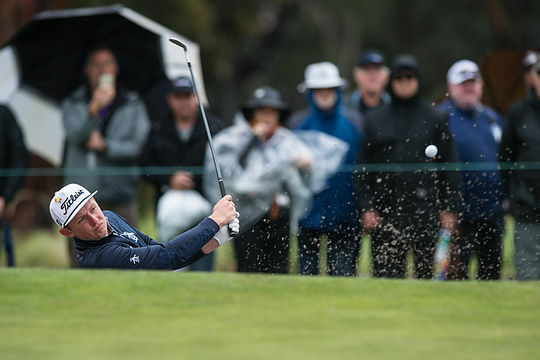 Australia’s chances of another World Cup victory have been blown away by wild Melbourne weather during the foursomes round at Metropolitan Golf Club. Conditions were simply tough as 35km/h winds and heavy rain lashed the Metropolitan Golf Club layout on the 28 teams playing alternate shot format. A double-bogey at the par-4 10th and three dropped shots earlier in the round saw Marc Leishman and Cameron Smith slip back to five-under-par and six shots off the pace. The Aussie paid finished at 4-over-par slipping from their overnight share of the lead to be in a tie in 8th position. Belgium pair Thomas Pieters and Thomas Detry and South Korea’s combination of Byeong Hun An and Si Woo Kim currently share the lead at 10-under-par. Pieters and Detry firing a 62 to move three positions up the leaderboard, with the South Korean pair also impressive with a round of 62 to retain their overnight lead. Peters and Detry combined well in the challenging format, with the pair setting each other up well with precision driving and approach shots in to the narrow Metro greens. Add to some excellent scrambling and par saving putts added to their impressive low round. “I think we played very solid,” said Pieters. Detry was also was pleased with their round given the conditions. Four nations Italy, England, India and Singapore share third position at 8-under, two stroke behind the leaders. Sitting four behind the leaders with two rounds to go does not rule out the Aussie charge. Saturday’s format of Fourball will see aggressive play by all teams and the Aussies will have to go low to erase the deficit. With the forecast for better playing conditions, the third round will undoubtedly prove pivotal for any Australian charge.